In this study, a coniferous tree species (Pinus tabuliformis Carr.) 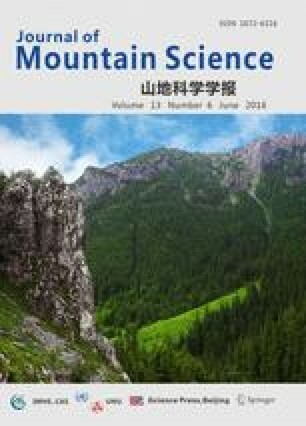 was investigated at a moderate-altitude mountainous terrain on the southern slope of the middle Qinling Mountains (QLM) to detect the trends in carbon isotope ratio (δ13C), leaf nitrogen content (LNC) and stomatal density (SD) with altitude variation in north-subtropical humid mountain climate zone of China. The results showed that LNC and SD both significantly increased linearly along the altitudinal gradient ranging from 1000 to 2200 m, whereas leaf δ13C exhibited a significantly negative correlation with the altitude. Such a correlation pattern differs obviously from that obtained in offshore low-altitude humid environment or inland high-altitude semi-arid environment, suggesting that the pattern of increasing δ13C with the altitude cannot be generalized. The negative correlation between δ13C and altitude might be attributed mainly to the strengthening of carbon isotope fractionation in plants caused by increasing precipitation with altitude. Furthermore, there was a remarkable negative correlation between leaf δ13C and LNC. One possible reason was that increasing precipitation that operates to increase isotopic discrimination with altitude overtook the LNC in determining the sign of leaf δ13C. The significant negative correlation between leaf δ13C and SD over altitudes was also found in the present study, indicating that increases in SD with altitude would reduce, rather than enhance plant δ13C values.